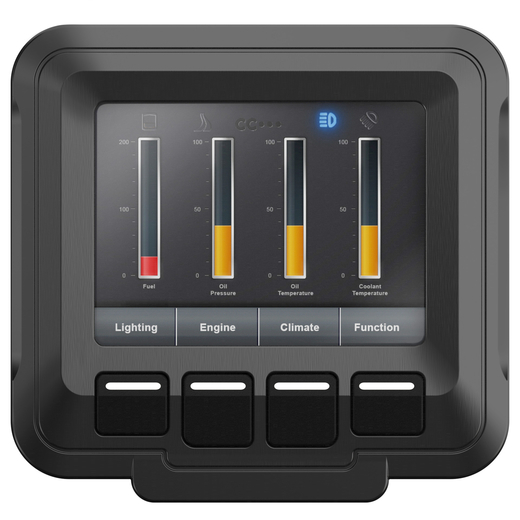 Maximatecc (Sweden) presented the CCpilot VI at Conexpo, which is a full-color display enabling user interfaces. It is designed for the off-highway and industrial markets and offers readability and so called all-weather performance according to the company. THE PRODUCT IS SUITABLE for both bracket mounting and integration in a dashboard. The 3,5-inch color display enables system designers to create a sharp and appealing interface for the operator. The four illuminated soft keys allow the operator interaction even when wearing gloves. The display can be panel mounted or fitted on a bracket. Dual CAN interfaces allow integration with engine/transmission ECUs and other controllers. The product is equipped with configurable digital and analog I/O ports, enabling integration of I/Os not accessible via CAN. With the company's Quic software configuration tool the user can program the display without having specific software skills, says the company. Quic runs on Windows-based PCs and allows the realization of different screens needed for certain vehicle applications.